Investing in leadership, excellence, legacy and perseverance since 1917. The David Eccles School of Business is celebrating 100 years of impact in community, entrepreneurship, innovation, scholarship and transformation. From a small group of students who huddled wherever they could find a classroom to study Commerce and Finance in 1917, to a robust alumni network more than 35,000 strong today, the David Eccles School of Business has certainly come a long way. We’re celebrating 100 Years of Impact this academic year, and we invite you to join us! View major events from Eccles School history on our timeline, read a message from our Dean, or share your own Eccles Experience with us to be included in the celebration. We can’t wait to see what the next 100 years has to offer. The best is yet to come! Click on the boxes below to read memories from your fellow David Eccles School of Business alumni. I was a high school dropout. I had great grades in high school, but struggled with some personal issues during that time period. I received my GED in 2000 and never thought I would be able to attend college as a result. I moved to Utah and decided to push myself and attend classes at a local community college. My dream was to transfer to Utah and finish my bachelor’s degree in business. At the time, I was working two jobs and taking one or two classes at a time. It was slow going, but my GPA was strong, so fortunately I was given a chance at the University of Utah and accepted into the school of business. My teachers pushed me. Hard. Prof. Dubil drilled present value calculations into my brain until I cried. Prof. Bigelow challenged my understanding of strategy and strategic thinking. Dr. Abe made me really dig deep and ask myself how I planned on making difficult ethical decisions. I learned from the best and the brightest, and I graduated with honors. I have since returned to the University of Utah as a proud employee. I help students through their MBA experience, and I am incredibly fulfilled by what I do. It has been a joy to return the help and support I was given. I am a true Ute and so proud to be part of the David Eccles School of Business. My, how things have changed! I had every one of my business classes in the Old Annex Building, and lived in the humble surroundings of Stadium Village. Our dean was Clyde Randall, grandfather of Taylor Randall. Our facilities were spartan, to say the least, compared to the terrific quarters that the students enjoy today. 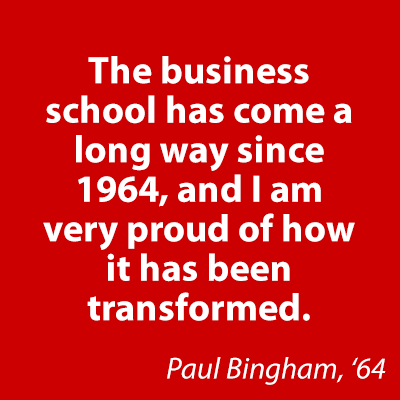 The business school has come a long way since 1964, and I am very proud of how it has been transformed. Dr. Eldon Facer, Professor of Finance and Chair of the MBA program in the late 60’s held a required MBA financial case study class. Dr. Facer would lead the discussion by asking questions and call on students to answer. If you had an unacceptable answer, he would make you believe there was a high likelihood that you would fail for inadequate preparation or illogical thinking And the questions, the analysis asked for, was never easy. The only way to avoid being called upon if you knew you did not have a good answer was to raise your hand. Some of the students never realized that he never called upon a student with a raised hand. 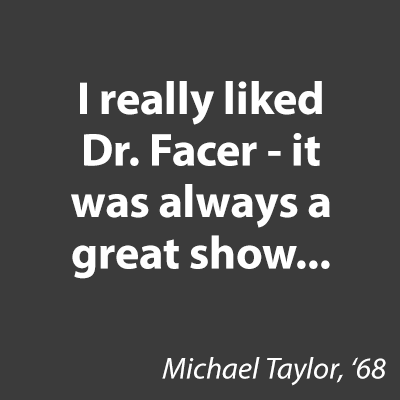 I really liked Dr. Facer – it was always a great show. I had the pleasure of taking one course from Dr. Abe Bakhsheshy in my time as a two year transfer to the David Eccles School of Business. The lessons he shared that have stayed with me since graduating on 2004 are many. 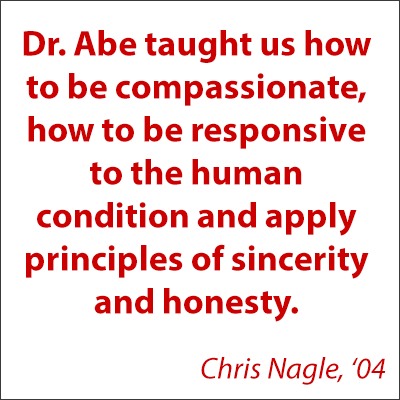 He taught how to be compassionate, how to be responsive to the human condition and apply principles of sincerity and honesty. I saw he is speaking this month at the U. I will make sure I am there to hear his wisdom. I appreciate leaders like Dr.Bakhsheshy being a part of the University and am a better person for having learned from him. I attended a JP Morgan Healthcare conference with a group of other Healthcare CEO’s on the top floor of the new Eccles School of Business building just a few weeks ago. I couldn’t help but reminisce on my journey building a multi-million dollar healthcare technology company over the past two decades as well as my most recent technology-based education company. I owe a great deal of the success I have enjoyed to the educational foundation I obtained while attending the UofU School of Business. Business is a language and if you don’t speak the language and obtain the tools for critical thinking, it will be very hard to expect to be successful in business today. With access to the new School of Business facilities, resources and technology, I can barely imagine the valuable education coming to the students at the UofU Business School today. I am forever grateful for all those amazing mentors and teachers I had as my Business School Professors who taught me so much those many years ago.. When I attended the business school was housed in the old WWII army barracks on the upper campus. Classrooms were not a pretty site! 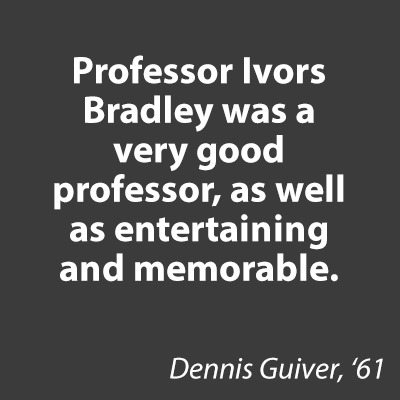 Memorable was Professor Ivers Bradley. Believe it was economics. Because he was so tall and the ceilings were so low he loved to draw bar graphs to the top of the blackboard and then onto the ceiling. He was a very good professor in addition to being entertaining and memorable. In 1968, while in the US Air Force in Frankfurt, Germany I met with U of U Professor Ramon Johnson as I considered various options for graduate school. It was Ramon who helped me decide to enter the U’s MBA program there. Thus, Ramon’s advice ultimately changed my life. Thank you Ramon! While in the program, I took MGT 651 (Human Behavior at Work) from Professor Arben Clark. In Arben’s course I became reacquainted with an area I had found very interesting as an undergraduate. After several discussions with Arben, I decided to pursue a doctoral program in organizational behavior. While finishing my Ph.D. program I again contacted Arben asking what he knew about the faculty job market in western US business schools. Among other things he told me that the U had openings. Ultimately I applied for a position and joined the faculty as assistant professor of management in 1974. Fast forward to 1987. Once more I asked Arben’s advice when considering the school’s deanship. Ultimately I accepted the position. 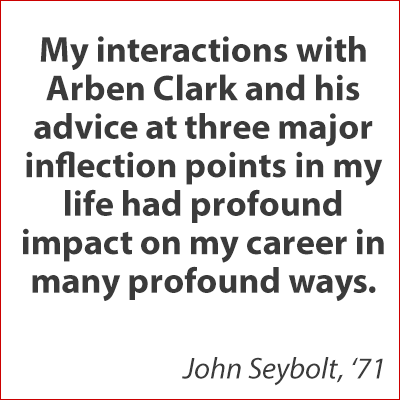 In sum my interactions with Arben Clark and his advice at three major inflection points in my life had profound impact on my career in many profound ways. In 1977, the University of Utah flew instructors to Grand Junction, Colorado where 32 people who were full-time employed in a variety of jobs. Five were nurses, five were policemen, and the remaining as social workers from several agencies. We met every Friday evening, all day Saturday and Sunday morning for two years in donated classrooms. All 32 completed the classes and were graduated in 1979 with a Masters Degree in Human Resource Management. I was one of the nurses, the oldest member of the class, and because of this degree became Associate Chief of Nursing at Grand Junction VA Medical Center. 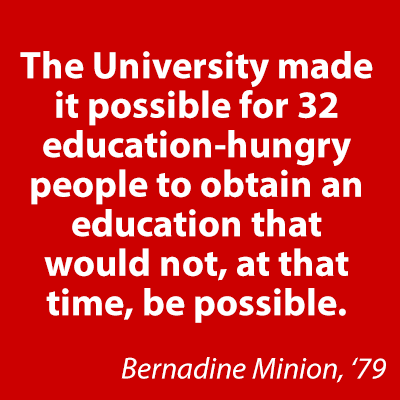 The University made it possible for 32 education-hungry people to obtain an education that would not, at that time, be possible without leaving their jobs and going to a University away from home and families. Most of us are now retired, but feel a great gratitude to the University of Utah.